Adjusting entries are made in your accounting journals at the end of an accounting period after a trial balance is prepared. The purpose of adjusting entries is to adjust revenues and expenses to the accounting period in which they occurred. After the entries are made in the accounting journals, they are posted to the general ledger in the same way as any other accounting journal entry. There are several types of adjusting entries that can be made, depending on the types of financial activities that apply to your business. When you record your accounting journal transactions during a month, for example, they are recorded in real time. If you are using an accrual accounting system, that means that the money did not necessarily change hands at that time. The purpose of adjusting entries is to show when the money changed hands and to convert your real-time entries to entries that reflect your accrual accounting system. Each month, accountants make adjusting entries before publishing the final version of the monthly financial statements. The five following entries are the most common types, although companies might have other adjusting entries such as allowances for doubtful accounts, for example. If you perform a service for a customer in one month but don't bill the customer until the next month, you would make an adjusting entry showing the revenue in the month you performed the service. You would debit accounts receivable and credit service revenue. A good example of accrued expenses is wages paid to employees. 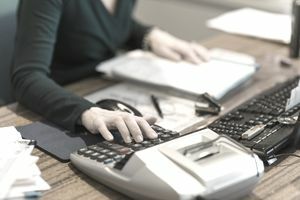 When a business firm owes wages to employees at the end of an accounting period, they make an adjusting journal entry by debiting wages expense and crediting wages payable. Unearned revenues refer to payments for goods to be delivered in the future or services to be performed. If you place an order for an item from a company on the Internet in February and that item does not arrive (and you don't pay for it) until March, the company from which you placed the order would record the cost of that item as unearned revenue. During the month which you made the purchase, the company would make an adjusting entry debiting unearned revenue and crediting revenue. Prepaid expenses is a very descriptive title. Prepaid expenses are assets that are paid for and gradually get used up during the accounting period. A common example of prepaid expenses is office supplies. A company buys and pays for office supplies. Gradually, during the accounting period, the office supplies are used up. As they are used up, they become an expense. During the month when the office supplies are used, an adjusting entry is made to debit office supply expense and credit prepaid office supplies. Depreciation is the process of allocating the cost of an asset, such as a building or a piece of equipment, over the serviceable or economic life of the asset. Adjusting entries are a little different for depreciation. Business owners have to take accumulated depreciation into account. Accumulated depreciation is just what it says - the accumulated depreciation of a company's assets over the life of the company. The accumulated depreciation account on the balance sheet is called a contra-asset account, and it is used to record depreciation expense. Increases are recorded as credits in contra-asset accounts. When an asset is purchased, it depreciates by some amount every month. For that month, an adjusting entry is made to debit depreciation expense - equipment and credit accumulated depreciation by the same amount. After you make your adjusted entries, you post your adjusted entries to your general ledger accounts. Prepare the adjusted trial balance. The process is just like preparing the trial balance except the adjusted entries are used. You correct any errors that you found.